This is just a sampling of VCS initiatives from the last 40-plus years. In modern day landscapes small flowering trees have an essential role in providing year-round interest without growing so big to dominate them. Increasingly, gardeners have sought out trees for foundation plantings or focal points that fit the scale of the garden and form the basis for a dynamic, beautiful, and diverse landscape. Join Tim Boland 10-11 am for an illustrated review of a wide assortment of small flowering trees that provide the right fit for your landscape needs. $5. Free for PHA members. Drop-off your used books for the Library Friends July Book Sale. Help by donating your slightly used books, DVDs, & CDs. The shores of Martha’s Vineyard can be a trap for all kinds of marine debris, and we need lots of help to keep it clean. Join Trustees staff at Norton Point to help make these “beach trails” safe and beautiful for the birds, and people too! Event is free. With spring in full bloom and summer upon us, what better to way to kick off the season than to get outdoors and celebrate National Trails Day (NTD)? Email: capepoge@ttor.org for more information. This recipe was from my Grandmother and is a great way to feed bluefish to people who otherwise might not touch it. The slightly larger blues also work perfectly with this recipe. It also works real well with Striped Bass. Don’t hesitate to make plenty because not only will it disappear faster than you thought it would but it also warms up well. Two good sized bluefish or bass filets; skinned and dark meat removed (unless those you are feeding like it). Lightly saute 3 cups coarsely chopped onions and 1 cup chopped celery in olive oil. Toss in 2-3 cloves minced garlic and a handful of parsley when nearly cooked. When done melt ½ stick butter and add the entire mixture to a prepared stuffing mix. I usually use Pepperidge farms cornbread stuffing mix because the flavors don’t have an overwhelming poultry seasoning flavor. (If you make the bread mix from scratch, just do the regular toasted and cubed bread thing and season with salt and pepper). Add a dash of salt, a few good shakes of black pepper, a dash of cayenne pepper, and 1 tsp. sugar and mix everything together. Have a can of chicken stock on hand to moisten the stuffing mix until it just holds together. Place several strips of bacon in the large baking dish you will be using to cook the fish and place in oven while it preheats to 350 degrees. Remove when the bacon just begins to melt so that it will be just slightly precooked and fully cooked when the fish is done. Thinly slice one lemon, and have another one halved for juice. Place one filet in a baking dish. Press stuffing mix together with your hands and set on top of the filet down the whole length about 3" thick. Set the other filet on top heading in the same direction. Sprinkle with lemon juice and place the bacon strips diagonally across the top of the filet; add the lemon slices on top. Sprinkle with a little paprika. Bake at 350 degrees for about 30 to 40 minutes depending on thickness of fish. Remove from oven, let cool for a few minutes, then slice diagonally and serve. What do we do in the rain? ...get wet! Harper and Hoffman Hearn take their first plunge of the season in Katama Bay (near the breach) on a rainy day in May. It's been a wet, dreary week, with only the occasional glimpse of sun passing so fast I never found the time to switch from boots to sandals. Coming out of an April that saw 5.23 inches of rain (an inch more than the average April), it seems reasonable to think about how – or if – this rain is related to climate change. Climate and weather are distinct, yet deeply connected. Since the weather is such a large presence in normal life (humans have surely been talking about the weather since the dawn of language), it's only natural that for most people, questions about unusual weather are the most common entrance to a discussion of climate change. Though it's not always welcome: Last night during a TV broadcast of a baseball game one announcer rather whimsically wondered whether the weather had anything to do with global warming, to which his partner replied, approximately, “Don't go there!” Well, why not go there? Some thoughts on two questions: Click HERE to read the full article. 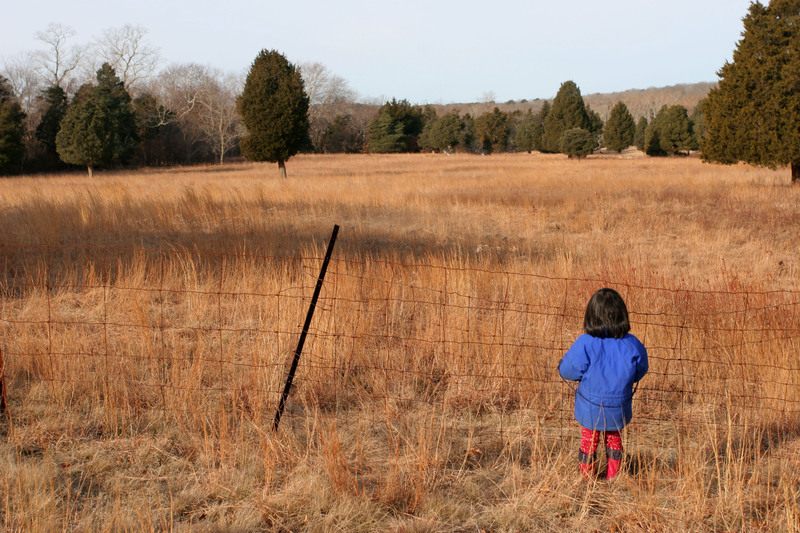 Mya O'Neill, looking over a West Tisbury field that will never be developed thanks to forward thinking and generous property owners. 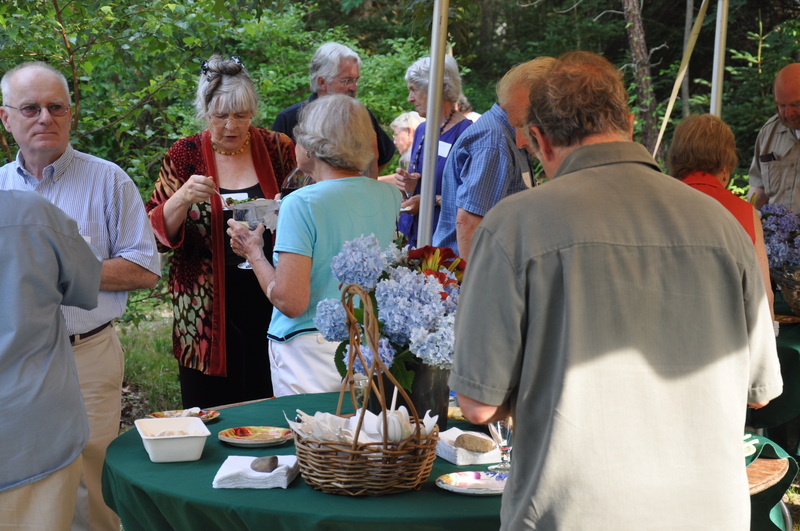 The decline in recent years in the number of donations of Conservation Restrictions on Vineyard land has to do in some measure with the failure of the tax code to keep pace with current land valuation realities. That is, IRS rules historically limited a landowner’s deduction on a gift of a CR to just 30% of their declared income in the year of the gift, with an ability to carry forward the balance of the deduction for only five successive tax returns. So a landowner earning an average income would never be able to “use up” the tax deduction generated by a six or seven figure conservation gift. That has finally changed, with new rules making it easier for a landowner to take full advantage of their deduction. The new rules, recently extended by Congress, raise the deduction for conservation giving to 50% of adjusted gross income per year, and extend the carry-forward period up to 15 years. For qualifying farmers (individuals or corporations) the deduction can be taken up to 100% of the donor’s adjusted gross income in the year of the gift, with a 15-year carry-forward. Most donors should now benefit fully from their contribution. Let’s hope this offers an incentive for Vineyard landowners to consider a gift of a CR on their land. Contact us if you are interested! The alternative is a Vineyard Lawn. Start by preserving as many of the shrubs and trees on your property as you can. The root systems of these plants bind the soil and prevent silty run off. Make the grass area as small as possible and plant a mix of seeds-- fescue, rye and clover are much hardier and more drought-resistant than fussy bluegrass. Without herbicides, up to 50 species of plants and lichens can flourish in your Vineyard lawn. Left alone to flower and seed naturally, they’ll provide habitat for butterflies, fireflies, bees and other wildlife and reward the eye with a variety of colors and textures. Have you ever looked objectively at a dandelion or a clover blossom? Their shapes and colors are lovely. Just ask the bees and butterflies. Resist lime: Vineyard soil is naturally acidic and mosses thrive in it, adding rich cushions of emerald. Don’t over water your grass; summer dormancy is normal and the golden-brown shades of August will refresh to green with September’s natural rainfall. Keep mowing to a minimum, never cutting lower than three inches, and let the clippings fall where they may--they’re a great natural fertilizer. In fall, spread a little organic compost and scatter a few native grass seeds (Blue Eyed Grass and Little Blue Stem are spectacular choices). In spring, your Vineyard lawn will reward you. BEAUTY AND BRAINS?... A RAIN GARDEN! A rain garden is a garden of deep rooted native plants, grasses and shrubs that is designed to absorb storm runoff from a roof, road or parking lot. Rain gardens are constructed by filling a basin in a low-lying area with a special soil blend, hearty plants, mulch and sometimes a layer of gravel. Why should I make a rain garden? Besides being beautiful, rain gardens prevent polluted storm water from entering our streams, ponds and bays. Rain gardens also help replenish our single source aquifer and our ponds by recharging rainwater into the ground rather than the storm drains. In fact, rain gardens absorb 30% more water than the same size area of lawn! Where can I find a rain garden near me? Tisbury Waterways Inc. recently planted a beautiful rain garden near the parking lot of the Vineyard Haven Yacht Club. As Earth warms, powerful storms are becoming the new normal. Overhead, tall, dense clouds are poised to burst, their presence a sign of an imminent deluge. These cumulonimbus masses are a reminder of the destructive floods that are occurring around the globe, which, taken together, are potent signals of one of the greatest environmental challenges of our time: global warming. Powerful rain and snow storms—and, ironically, intense drought periods—are a well-known consequence of a warmer planet.